Surrounded by wicker baskets, carved wooden masks and African beads, I strained to hear the roar of a lioness, or at least the distant sound of a stampeding hoof on dry soil. Instead I was met with the bellow of a taxi horn and the distant shuffle of slip-on sandals on concrete. Inside The Abyssinian, I was in the Horn of Africa. Outside The Abyssinian, I was in the middle of Kensington on Racecourse Road. 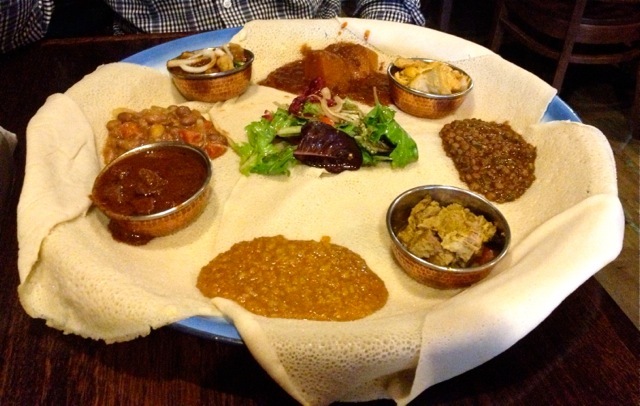 The Abyssinian specialises in Ethiopian fare from the Horn of Africa. 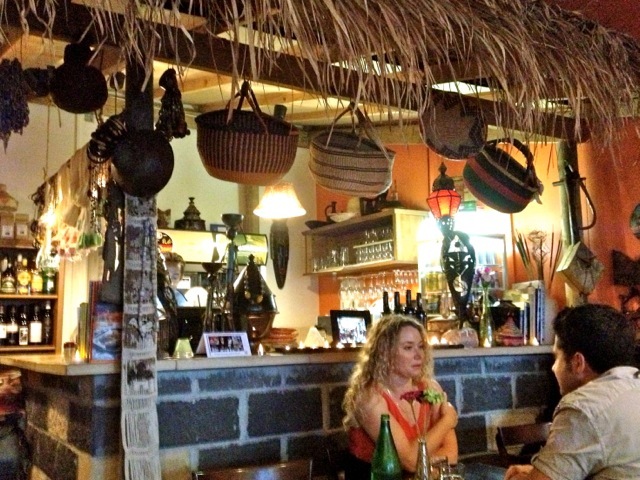 After a bit of research, it seems to be considered the best African food in Melbourne. I only have a few places to compare it to, but I no longer feel the need to keep trying new African restaurants. I’ve found my favourite. 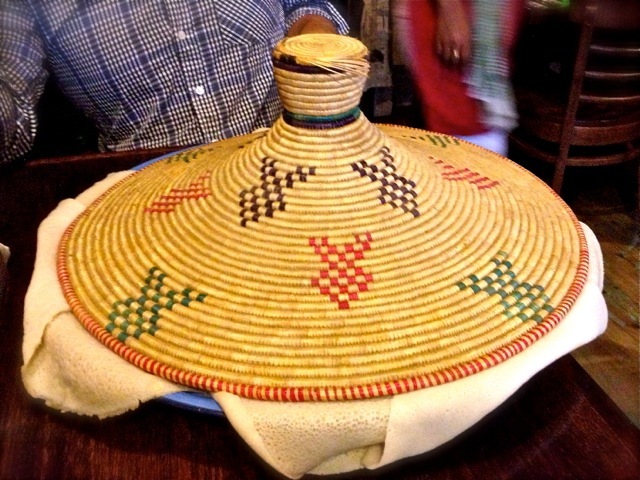 I was whisked away to Africa on Valentine’s Day for something “not too fancy and a little bit different”. He must have read my ‘Affordable Melbourne Date Restaurants for Valentine's Day’ blog post, where I wrote, “I'd be much more impressed by a memorable date with good food and a top-notch atmosphere than a 17 course degustation with a horse and cart drop off.” Huge brownie points. The Abyssinian is my definition of the perfect casual date place. It’s also brilliant for a group of mates who want to catch up over drinks and extraordinary eats. Make sure you book if you plan to visit. Once you’re there, order the mixed platter. It's got a little bit of everything: lamb, fish, chicken, vegetarian and a special or two. The platter is $25pp or $45 for two. Each additional person is an extra $22. 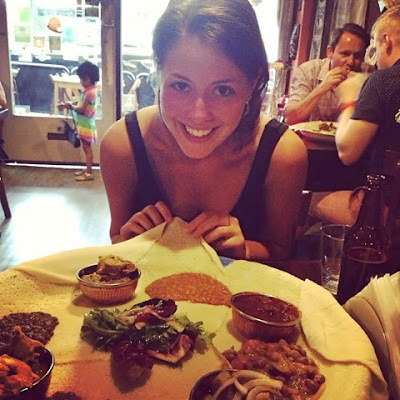 A flying saucer of a tray was presented to our hungry table of two. The colourful wicker cover was removed to reveal an enamel tray cloaked in blankets of sour ‘injera’ – the traditional (and mildly addictive) African flat bread with a spongy texture. Piles of aromatic curries and stews were deliciously slopped on top of the injera: 'tumtummo' lentils with African spices; 'dubba' pumpkin drowning in Berberé sauce; 'aletcha' cabbage and carrots in a garlicky vegetable ghe; tender chicken in a creamy turmeric sauce; spicy lamb in a thick and fragrant ghee; perch with onion, spiced ghee and Berberé sauce; and slow cooked goat with tangy flavours of lemon, cardamom, clove and cinnamon. The best way to conquer the platter is to use your hands, tearing off pieces of injera and using them to scoop up the stews. This particular night was one of the few occasions where we couldn’t finish what lay before us, but we agreed nonetheless that food definitely tastes better when eaten your hands. 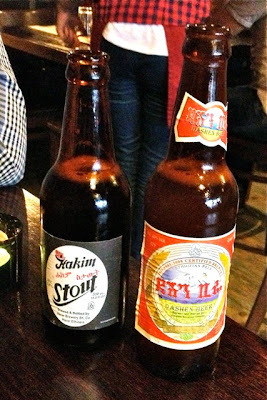 We paired our dinner with Ethiopian beer, bickering over whether the Hakim stout or Dasheen Lager was better until they were both finished. The final decision was that they were equally enjoyable – especially at $6 a bottle. Beer complemented our food so fantastically that I’d skip wine, unless the offer of B.Y.O at $8 corkage per bottle is too good for you to refuse. Desserts such as cream caramel, frozen yoghurt with berries, and vanilla ice cream with Campari sauce didn't scream ‘eat me’, so we drove to Lygon Street on the way home and stopped at Helados Jauja ice creamery. Everyone goes on about the dulce de leche, an Argentinean-style caramel that quickly became Helados Jauja’s signature ice cream flavour. Sure, it was sweet and smooth and everything quality ice cream should be, but it paled in comparison to the textural apple crumble with chunks of apple and clusters of brown sugar and cinnamon. We enjoyed the ice cream, however we would have been more partial to it if it didn’t cost $8.60 for two scoops. That’s $17.20 for two people, by the way. After rolling back to the car, a fit of ‘food crazies’ endured. 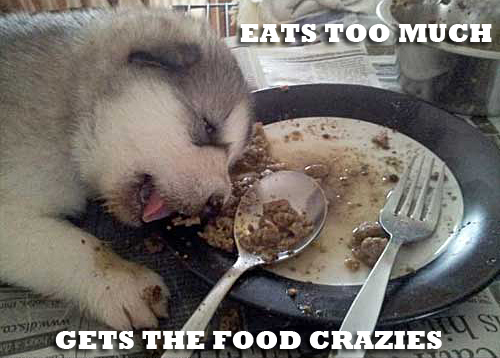 Food crazies can be defined as: “the tendency to lapse into a temporary state of unjustified hilarity following an excessive bout of eating”. Put simply, it’s when you’re so full you want to laugh and then cry and then laugh again. If symptoms persist, see your doctor. In a single night, I felt as if I’d traveled to Africa for dinner and then to a busy restaurant strip in Europe for dessert. As I lay in bed with a stomach bursting with Ethiopian goodness, I couldn’t help but be grateful to live in such a wonderful city. I also couldn’t get the Lion King’s Circle of Life out of my head. I've got the same take as you! But to be honest, I've since visited Spring Street Grocer and it is THE BEST ICE CREAM I'VE EVER HAD. Hopefully the capitals portray how serious I'm being! If you're an ice cream lover, go to Spring St Grocer!